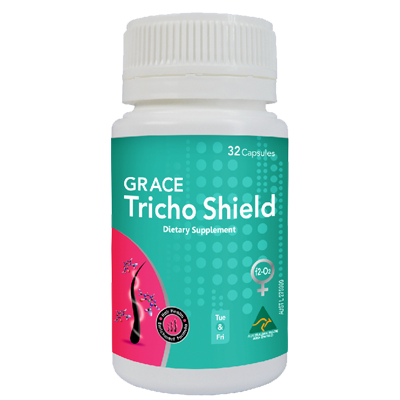 Grace Sprirulux, Grace CAL D3, Grace Tricho Shield, Grace Tricho Ferum, Grace Alexa and Grace Tricho Proteins. For Composition, Dosage and Related Statements refer to the appropriate descriptions. 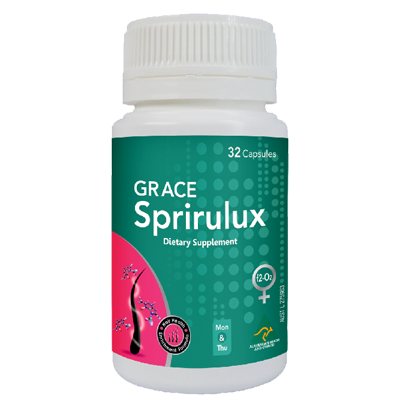 Spirulina has been widely used for promoting hair growth and to combat hair problems like thinning hair and baldness. Due to its unsurpassed nutritional profile, spirulina seaweed has been touted as one of the world's greatest super-foods, with an impressive array of potential health benefits. It is particularly rich in nutrients that are thought to help prevent hair loss, which is why spirulina is often used as a key ingredient in natural hair loss prevention products. Spirulina is a concentrated source of both iron and copper — two important minerals you need to prevent hair loss. This remarkable seaweed also contains numerous other health hair promoting nutrients, including beta-carotene, vitamin E, and vitamin C. Spirulina contains amino acids, essential fatty acids, vitamin A and beta-carotene, all of which are great for hair. Spirulina acts as an antioxidant compound and taking it for 4 weeks may help to make your hair dandruff-free, glossy and stronger. Soya oil, gelatin (bovine), glycerol, lecithin, water - purified, vegetable oil - hydrogenated, beeswax - yellow, curcumin (turmeric), titanium dioxide, disodium edetate, brilliant blue FCF (FD&C Blue No. 1), mannitol, maltodextrin. Take 1 capsule on Monday and 1 capsule on Thursday or as directed by your healthcare practitioner. if you have kidney disease or are taking heart or blood pressure medicines. Storage: Store below 30°C (86°F), away from direct sunlight. Calcium is one of the most vital minerals required to ensure proper growth, reproduction and maintenance of the body. Calcium also helps with the contraction and relaxation of muscles, nerve signalling, blood clotting and with the secretion of hormones and enzymes. 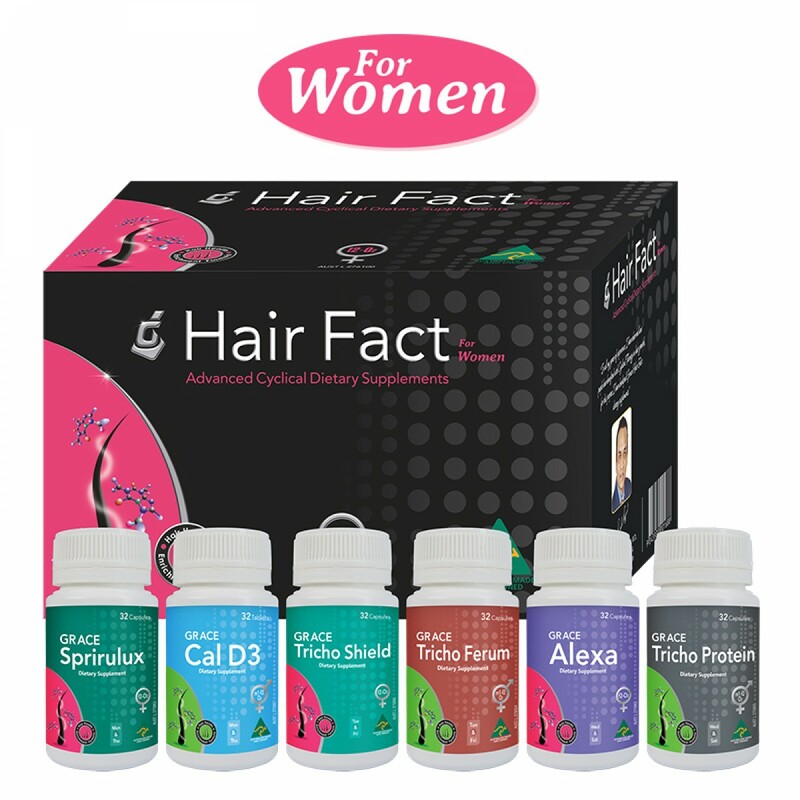 Hormones such as androgens, stimulate hair growth; enzymes such as biotin promote cell growth and strengthens healthy growing hair. 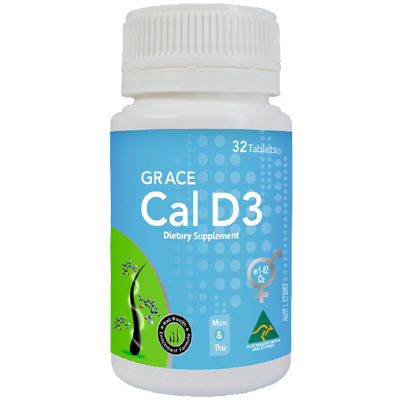 When there is not sufficient Vitamin D (not only required for absorbing calcium) hair loss may be experienced. The sulfur and selenium contained within garlic can help fortify the structure of the hair shaft, meaning it cannot only help to replenish lost hair, but can strengthen existing hair as well. The vitamins and minerals that each clove of garlic is imbued with can also naturally condition your hair while adding strength. Grape seed extract is a great choice for hair care as it contains vitamin E, necessary for hair growth and health. The extensive proteins, minerals, and the linoleic acid it contains also offer significant benefits for hair health. The OPC's (Oligomeric Proanthocyanidins) that are in contained in the grape seed, inhibit the production of DHT, one of the main factors in hair loss. The OPC's also stimulate hair follicles, promoting healthy hair growth. 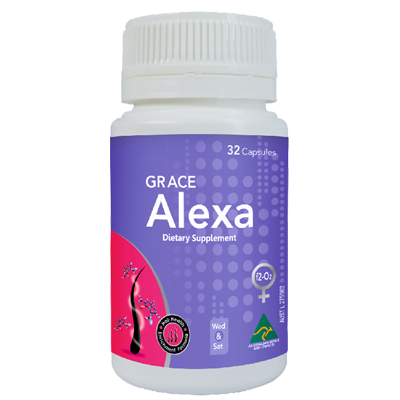 Grape Seed can help to "reverse" the effects of aging due to its detoxifying agents. Grape seed extract lowers the amount of DHT in the hair follicles, meaning that it will stimulate the follicles so they are healthy, allowing new, healthy hair to grow quickly. Grape seed extract can help improve your cardiovascular system, increasing blood circulation, resulting in plenty of oxygen and nutrition, leading to healthy hair growth. Cellulose - microcrystalline, crospovidone, croscarmellose sodium, magnesium stearate, silica - colloidal anhydrous, titanium dioxide, opadry amb film 60W6812 white, opadry film OY-29020 clear. Take 1 tablet on Monday and 1 tablet on Thursday or as directed by your healthcare practitioner. Pumpkin seed (Cucurbita pepo) oil is obtained by expeller-pressing toasted, hulled pumpkin seeds. 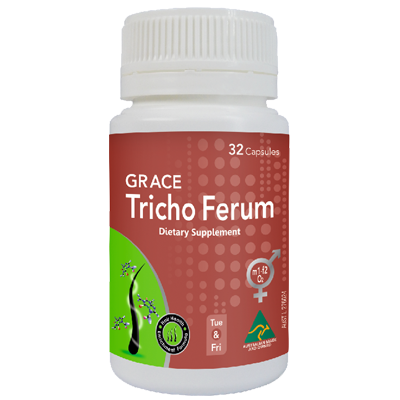 It is a rich source of antioxidants, essential fatty acids, minerals, and more. Studies have shown that taking a Pumpkin Seed Oil (PSO) supplement for 24 weeks has a positive anabolic effect on hair growth in patients with mild to moderate Androgenic Alopecia (AGA). They believed this could be due to the possible effects of 5-reductase inhibition. The most useful part of the plant is the root which is usually used dried in powder form in many Japanese knotweed supplements. This is arguably the best way to obtain what is also often called Polygonum Cuspidatum root extract – the real “power hitter” to be found in Japanese knotweed. Japanese Knotweed is a very rich source of resveratrol, a phenol or plant steroid. Japanese Knotweed resveratrol is linked to several important health benefits. Resveratrol is the same substance found in red wine that is linked to improved health and why moderate red wine drinkers often exhibit improved health over non-drinkers. If you scratch your skin hard enough, you will raise a red, swollen line called a welt. This is inflammation in action. Now imagine that same inflammation occurring inside your body. Affecting cells, organs, and systems, inflammation can increase your risk of suffering a host of serious medical conditions. Resveratrol is a proven anti-inflammatory agent that has been shown in studies to reduce the markers of inflammation. In short, from your heart to your brain to your digestive system, Japanese Knotweed extract, because of its high resveratrol content, is very good for all aspects of your health. In the same way, that metal rusts when exposed to oxygen, your body suffers damage because of oxygen too. This is commonly called oxidative stress which causes an increased in substances called free radicals. Free radicals are unbalanced molecules with an unpaired electron in their outer shell. To try and become balanced again, free radicals “steal” electrons from neighbouring molecules. This causes a cascade of unhealthy reactions throughout your body. Free radical damage is one of the main reasons that, with age, our bodies start to break down. Cells, tissues, organs and systems simply wear out because of free radical damage. While you cannot get by without oxygen, you can take steps to reduce free radical damage. Anti-oxidants slow or stop free radicals from stealing electrons from other molecules and one of the most powerful is resveratrol. Because Japanese Knotweed is very high in resveratrol, it can help prevent free radical damage and that will enhance virtually every aspect of your health. Gelatin (bovine), soya oil, glycerol, vegetable oil -hydrogenated, lecithin, water - purified, beeswax - yellow, calcium hydrogen phosphate dihydrate, d-alpha-tocopherol, cochineal (cochineal extract), brilliant blue FCF (FD&C Blue No. 1), titanium dioxide. Take 1 capsule on Tuesday and 1 capsule on Friday or as directed by your healthcare practitioner. This product contains selenium which is toxic in high doses - adults should not exceed a daily dose of 150µg of selenium from dietary supplements. Gelatin (bovine), cellulose - microcrystalline, calcium carbonate, citric acid, water - purified, silica - colloidal anhydrous, magnesium stearate, hypromellose, maltodextrin, sodium lauryl sulfate, silicon dioxide. The deficiency of EPA and DHA within the diet contributes to skin conditions such as dandruff, thinning hair, eczema and psoriasis, as well as age spots and sun spots. Without these essential fatty acids, too much moisture leaves the skin. The truth is, your internal health can appear on your skin and taking fish oil internally as a supplement may be as good as if not better than applying conventional moisturizers. One of the biggest reasons fish oil leads to healthier skin is because it reduces inflammation. In fact, several studies have found that supplementing with fish oil reduced the appearance of acne and eczema. Gelatin (bovine), glycerol, lecithin, vegetable oil -hydrogenated, water - purified, calcium hydrogen phosphate dihydrate, beeswax - yellow, cochineal (cochineal extract), brilliant blue FCF (FD&C Blue No. 1), mannitol, titanium dioxide, maltodextrin. Take 1 capsule on Wednesday and 1 capsule on Saturday or as directed by your healthcare practitioner. and/or loss of appetite, stop using this product and consult your healthcare professional. This product contains selenium which is toxic in high doses - adults should not exceed a daily dose of 150,ug of selenium from dietary supplements. Clearly healthy hair requires plenty of keratin, and to a lesser extent, collagen. 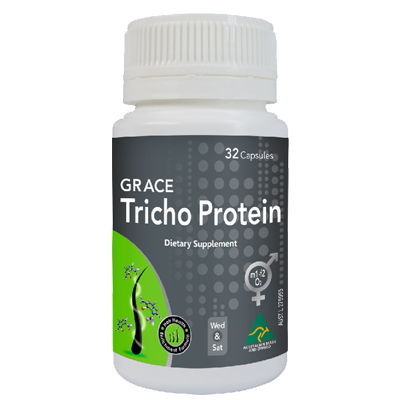 For the body to produce these structural proteins, it must have sufficient access to certain amino acids. There are two key amino acids necessary to produce keratin: cysteine and lysine, Collagen production relies on access to the amino acids lysine, glycine and proline. Of these amino acids, lysine is classed as essential, meaning that they must be sourced from our diet. The other important amino acids for healthy hair growth can be synthesised by the body, although they may be in low concentrations, if nutrition is poor. Calcium hydrogen phosphate dihydrate, gelatin (bovine), water - purified, magnesium stearate, silica - colloidal anhydrous, sodium lauryl sulfate. adults should not exceed a daily dose of 150pg of selenium from dietary supplements.